The conference will be divided into six themes spanning over two days. Besides, the “special Homage” session will be a kind of “conference within a conference” as it will celebrate the Centenary of the birth of Fr Yves Raguin, s.j. (1912-1998). Fr Raguin was the author of a number of influential spiritual books. He was also a beloved spiritual master whose influence spreads over Asia and Oceania and other continents as well. His thought and spirituality were marked by the spaces he traveled through and the people, he met with, of all races, religions and cultures. In several respects, he was truly an “Oceanic man.” Remembering his life and the spiritual style he cultivated will help us to sketch the Asia-Pacific history of spiritual encounters during the last fifty to sixty years and to better formulate the spiritual challenges that are emerging today. Along with the conference, there will be the fourth “Life Sustainability Awards”. The recipients of the prizes, selected from candidates from the Oceanic continent, will reflect the creativity and spiritual variety that the conference intends to assess and celebrate. 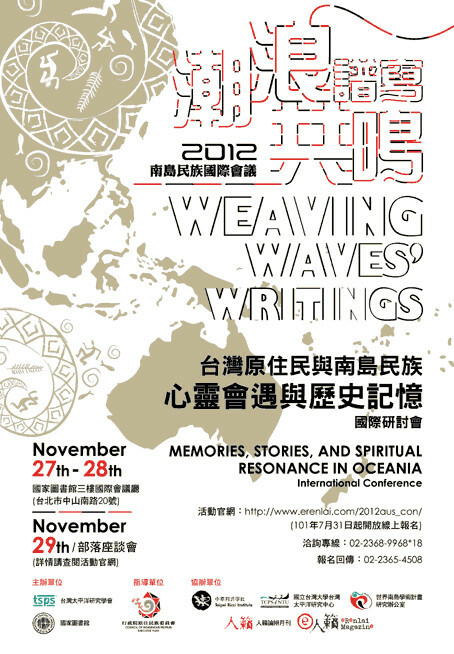 This conference is organized by the Taiwan Society for Pacific Studies and sponsored by Council of Indigenous Peoples, Taiwan(ROC). The Pacific Ocean is not only a physical space but a mystical one too: its immensity and the experience of its crossing have inspired in-depth spiritual experiences expressed through stories, myths, music and epics; its borders and islands have witnessed the advent and the decline of all the world’s mystical traditions breaking along its shore wave after wave; it is ultimately one of the privileged spaces where humankind has refined their experience, chanting it in resonance with the Divine. The commonality of such spiritual experiences is sometimes summarized in the term “Oceanic Feeling”, though such wording remains open to challenges and controversies. Linguistic and musical expression, mystical experience, literary and artistic metaphors, and cross-cultural interaction all form part of the integrity of the region. This conference aims to assess and describe the spiritual and historical resources of Oceania and of Austronesian peoples as well as the creative ways through which they are expressed. The Depth and the Length of the Ocean within Me – In Remembrance of Fr Yves Raguin, 1912-1998. Yubax, a young Atayal Aborigine discovers the Solomon Islands. After graduating in Pacific and African history from Otago University, Professor D’Arcy studied at the University of Hawai'i at Manoa and worked as an archaeologist and for Television New Zealand, before completing his MA at Otago and PhD at ANU. He teaches courses in Pacific, environmental, and world history, as well as colonial race relations, and has taught at Otago, Victoria University of Wellington and James Cook University in Queensland. His current research focuses on the problems and benefits of interdisciplinary collaboration, the history of conflict and conflict resolution in the Asia Pacific region, and Australia's historical relationship with its regional neighbours. Education: BSc(Hons) in Business Management, BA(Hons) in History Government. MA in Pacific Islands Studies. PhD in Political Science. Professional: Cook Islands cultural specialist/drummer. Secretary of Foreign Affairs for Cook Islands Government 1983-1986. Director of Programs for South Pacific Commission 1987-1990. Secretary General for South Pacific Commission 1990. Secretary of Cultural Development for Cook Islands Government 1990-1993. Professor of Political Science, Brigham Young University, Hawaii 1993-2012. Cook Islands High Commissioner to New Zealand, Australia, Papua New Guinea, and Fiji 1997-1999. Director of Pacific Islands Studies, Brigham Young University Hawaii 1999-2000. Former Chair of Political Science Department, Brigham Young University Hawaii. Interests: Martial Arts (Karate styles - Shitoryu, Kei Shin Kan, and Shindokai). Poetry writing. Composing Pacific music. Researching and writing about Cook Islands Culture and Pacific history. Painting. Gardening. Futures studies. Hsin-ya Huang is Professor of American and Comparative Literature and Dean of the College of Arts and Humanities at National Sun Yat-Sen University, Taiwan. In addition to numerous articles, her book publications include (De)Colonizing the Body: Disease, Empire, and (Alter)Native Medicine in Contemporary Native American Women's Writings (2004) and Huikan beimei yuanzhumin wenxue: duoyuan wenhua de shengsi (Native North American Literatures: Reflections on Multiculturalism) (2009), the first Chinese essay collection on Native North American literatures. She is the guest editor of a special forum on transnational Native American studies for The Journal of Transnational American Studies (U of California, Berkeley, eScholarship) and a special issue on eco-criticism for Comparative Literature Studies (Penn State). She is also editing the English translation of The History of Taiwanese Indigenous Literatures and two essay volumes, Aspects of Transnational and Indigenous Cultures and Global Encounters: Taiwan Literature vis-à-vis World Literatures. She is Editor-in-Chief of Review of English and American Literature. Her current research project focuses on Trans-Pacific indigenous literatures. Chih-Huei Huang, assistant research fellow at Institute of Ethnology, Academia Sinica, centers her research on cultural anthropology, ethnology, Okinawa studies, Japanese studies and Taiwan aborigines studies. Huang is a member of cultural heritage commission of Hualian county, member of world heritage committee of Taitung country and board of Millet (Indigenous People’s Culture) Foundation. A Report on Aborigines’ Customs 《番 族慣習調查報告書》, Huang’s edited and translated work, received excellent aboriginal academic paper award from the Ministry of Education in 1997 and 1999 respectively. Huang also edited The Status Quo of Aborigines in Taiwan《台湾原住民の現在》(2004) and Essays in Honor of Professor Pin-Hsiung Liu《寬 容的人類學精神──劉斌雄教授紀念論文集》(2008). She started her research on the war experience of aborigines in 1998. Huang has published papers mostly in Japanese and English. “The Yamatodamashi of the Takasago Volunteers of Taiwan: A Reading of the Postcolonial Situation” is one of her recent works. Lungnan Isak Fangas, Amis, has devoted into the shooting of documentaries after he graduated from the Department of Sociology, National Taiwan University. He received his MFA in film and media production at University of Texas at Austin. Lungnan began filming documentaries when he was still in college. Angoo (1999), Finding Salt (1999) and The Lost Two Years (2002) are some of his early works. His focus on independent bands, rock music and adolescent subculture has brought him to the production of a series of work, including Ocean Fever (2004), Ocean Fever 2 (2005) and Who Is Singing There (2009). This series received nomination as best Taiwan documentary in Taipei Film Festival and was aired in the US and South Korea, more importantly, it has documented valuable moments of Taiwan’s modern rock music history. Lungnan started his film production career since 2010. Taivalu, his first documentary production featuring Typhoon Morakot, has received grand prize and best documentary in Taipei Film Festival 2011. In the same year, Wonderful Time Film Production was established and its latest film, The Making of On The Road (2011) has aired almost 60 times touring Taiwan and has been watched by more than 3000 person times. Lungnan will complete La Michael and Story Island by the end of 2012. Both are worthy of expecting in that a new approach incorporating movie, choreography and musical is applied to both works. Si yabosokanen (Tao) is a documentary media worker. She graduated from Tzu Chi University with an MA in public health and has served as a home care nurse and a clinic nurse at the health station in Lanyu township. She is also the funder of House Care Association of Orchid Island. Her documentary work, Facing the Demon, displays the cultural differences between modern medical ideas and the tribe men’s ideas of evil spirits on ailment, it also records the struggle between home care nurses, volunteers and traditional, resisting family members. Facing the Demon was selected as the closing film of the first Taiwan International Ethnographic Film Festival and as the opening film of the Aborigines Video/Audio Documentary 2001 (2001年原住民影音紀錄片). Si Yabosokanen’s documentary works include Inreshan in Orchid Island When She’s 7 《七歲在蘭嶼-音拉珊》, Si Yabosokanen (one that has nothing to eat)《希.雅布書卡嫩(沒有飯吃的人)》and A String of Crabs for A Man I Love《一 串螃蟹獻給我心愛的人》. She is a home care nurse (without salary) of House Care Association of Orchid Island, and is preparing to establish Yabosokanen Home Care Center now. I have been the managing editor of eRenlai.com since 2007, the online version of the Renlai Monthly magazine published by the Taipei Ricci Institute (TRI) in Taiwan. Being born and raised in France to Taiwanese and Cambodian parents, I have now been living in Taipei for 7 years. Because of my personal background and history, I have always nurtured a special interest for questions of identity and belonging. I graduated from La Sorbonne in French modern literature, I am more orientated toward the arts as a person, rather than towards the more technical side of things and I dabbled in different visual arts such as painting and photography during my years in high school and university. In 2009, I had the chance to participate in the making of the first movie produced by the TRI, On the Fifth Day, the Sea Tide Rose, a documentary filmed in Tafalong, an Amis village on the East coast of Taiwan. This year, it's my pleasure to present my directorial debut, under the guidance of Benoit Vermander (TRI academic director): Writings that Weave Waves, a film which was born of my experience documenting a cultural exchange program between young aboriginal students from Taiwan and the First Nations community in Canada in September 2011 for eRenlai. Benoit Vermander was born in 1960. He holds a doctorate in political science from Institut d’Etudes Politiques de Paris and a MA in the same discipline from Yale University. He also got a doctorate in theology from the Jesuit faculties of Paris after having completed his licentiate in theology at FuJen University. He is now researcher and associate professor at Fudan University, Faculty of Philosophy, Department of Religious Studies. Concurrently, he serves as the academic director of the “Xu-Ricci Dialogue Institute” attached to the same faculty. He is also associate researcher at AsiaCentre, Sciences-Po Paris. Morgan Tuimaleali'ifano is Samoan by birth with Tongan and European ancestry, and is married to Eileen, a Fiji citizen of Polynesian, European and Asian ancestry. Their children are typical of contemporary Pacific Islanders, diverse ethnic and cultural affiliation. He writes about them as the forerunners of what can he describes as Pan Pacific people – those who belong not just to one particular space but identify with several and are more at home in multi-cultural settings. He began working at USP in 1977-83 as an administrator before joining the Department of History and Politics in 1988. His BA and MA degrees in History and Anthropology are from USP and his PhD in Pacific History was done and supervised at ANU. Both post-graduate degrees resulted in books. His teaching and research interests are indigenous and introduced governance systems with special emphasis on the loss of autonomy in the 19th century and the possibility of losing it yet again. His post-graduate course on Pacific Island diasporic communities explores a Pan Pacific identity for the region's citizens in a future united Pacific Islands. He is the current Head of School of Social Sciences which offers six academic programs; History, Psychology, Sociology, Social Work, Gender Studies and Pacific Policing. He has served on the University Council from 2007-2009 and is a current member of Senate. Ms Teurumereariki Hinano MURPHY is President of the TE PU ATITI’A NGO. She is working at the University of California Berkeley Richard Gump South Pacific Research Station as an associate Director, and leads the Station's outreach programs through the Atitia Center. The Gump Station and Te Pu Atiti'a pursue common educational and research programs focused on marine and terrestrial biodiversity, traditional knowledge, culture, and the relationship between human societies and natural ecosystems. The Atitia Center thus provides an excellent opportunity for interaction and exchange, enabling visiting students and researchers to learn from local experts, and vice versa, building on and expanding the knowledge base together through scientific research. Already, this exchange has catalyzed joint research programs. The common goal: to document, promote and preserve Polynesia’s biocultural heritage. Wu is a student of Graduate Institute of Ethnomusicology, Tainan National University of the Arts. Majoring in Guzheng with a minor in Guqin, Wu has been in several university musical performances. He has also held individual open concerts and participated in joint concerts at Nantou cultural center and the music Hall, Tainan National University of the Arts. Wu’s current study focuses on the Indonesian and Chinese music culture. During 2011-2012, Wu embarked on a field trip centering on catholic music played with gamelan at Mass in Yogyakarta, Indonesia. This study will be developed into his future thesis. Fabrizio Bozzato, born in 1973 in the Veneto Region (Italy), is a political analyst with a keen interest, and significant experience, in Pacific Studies. He holds an M.A. in International Relations (University of Tasmania, Australia) and a Master in Political Science (University of Milan, Italy). He also attained a Grad. Dip. in International Politics with high distinction (University of Tasmania, Australia). He has lectured at international conferences and at the Centre for International and Regional Affairs at the University of Fiji (Fiji Islands). Fabrizio is based in Taiwan, where he is an Associate Researcher at the Institute. He is presently pursuing a PhD in International Affairs and Strategic Studies at Tamkang University (Taiwan) and believes that "the currents of the global ocean are shifting from the Atlantic to the Pacific Rim, and especially Asia." [Langi Kavaliku]. Vavauni Ljal jekegan (Xiang-yun Hong) was born in Sagaran Tribe in Sandimen Township, Pingtung County, Taiwan. She is a master’s student at the Institute of Austronesian Studies, National Taitung University and an indigenous visiting scholar at the institute of Ethnology, Academia Sinica in the academic year 101. Her thesis aims at exploring the status quo and mechanism of the spiritual healing and restoration of local aboriginal peoples after Typhoon Morakot. The thesis applies a narrative inquiry method and a new perspective to listen to the local aboriginal peoples’ voices regarding external resources as well as social and cultural changes. In a study that both parties are treated both as subjects, she wants to reflect on the situation where the local culture does not receive sufficient understanding. Chi-Shan Chang, received a M.A. in Forestry from National Taiwan University in 1992. Currently he is a doctoral student in Natural Resources and Environmental Studies at National Dong Hwa University and a research assistant in the Division of Exhibition and Education, National Museum of Prehistory, Taiwan. In 2009, 2010 he went to central Sulawesi and Hawaii to conduct field work on tapa-making. The dissertation research takes “tapa” as the core topic, analyzing “tapa culture” from the perspective of genetics-oriented phylogeography and anthropological material culture, aiming to demonstrate an integrated research view. Chen obtained her B.A. in ethnology from National Chengchi Univeristy and M.A. in Anthropology from National Taiwan University. She is currently a doctoral student of Architecture at National ChengKung University. Chen’s dissertation centers on the changes of settlement in Luzon’s highland, the Philippines, exploring the development model of colonial power in Luzon’s highland and its impacts on the traditional settlement of the aboriginal tribes since the early twentieth century. Theresa C. Arriola, a proud Chamorro woman, has taken great interest in the well-being and promotion of her island people and Chamorro heritage. Protective of her indigenous Chamorro culture, Arriola has been active with Pa’a Taotao Tano’, a Guam non-profit cultural organization established in 2001 as Board Member, and for the last six years as Marketing Director/Grant Writer and Project Director for many federal grants including several ANA Grants from the Department of Health and Human Services. Arriola has recently been elected as Chairperson for the 12th Festival of the Pacific Arts Guam Organizing Committee charged with planning Guam’s hosting of this International Festival in 2016. Arriola sits on the Guam Visitor’s Bureau Board of Directors as Board Secretary and Chairperson of the GVB Culture Heritage & Community Outreach Committee. Under her leadership, the Cultural Committee was re-established as a permanent Standing Committee of the GVB Board and the Guam Chamorro Dance Academy in Tokyo & Guam and the creation of the Guam Island Fiesta Tour was established. In addition, Arriola sits on the Board of Directors for Payuta, Inc. (umbrella organization of Guam Non-governmental organization’s) as Board Treasurer. She has held many management positions throughout her working career including eight years as Deputy General Manager of the Guam Visitors Bureau, Chief of Staff of Senator Toni Sanford/Committee on Economic Development & Retirement and Policy Advisor to Senator Rory Respicio/Committee on Youth and Senior Citizens, Federal and Foreign Affairs, Military and Veteran Affairs, Human Resources and Natural Resources. Pu, Zhongcheng, Cou, is currently an examination committee member. Pu is also a former teacher of the Affiliated Senior High School of National Taiwan Normal University, associate professor of National Hualien Teachers College, preparatory committee member of National Chi Nan University, deputy minister of Council of Indigenous People, Executive Yuan, chair of Department of Chinese language and literature studies, Taipei Municipal University of Education, and curator of National Museum of Prehistory, Taitung. Pu is the first Phd holding a Taiwanese university’s degree in ethnology with a focus on Taiwanese aborigines. Pu’s research specialties include mythos and religion of aborigines, folk literature and so on. Masao Aki is an Tayal from Hsinchu county. In 1994, he attended the training for indigenous reporters held by PTS. In 1998, he was the anchor and producer of Indigenous News Magazine in PTS. At that time, he was also the evening news anchor of PTS news, one of the first aborigines to become a news anchor in the broadcasting history of Taiwan. In 2003, Masao directed one of a series of PTS’s documentary films on the education revolution in Taiwan. In 2005, he accomplished a series of documentaries called “Teacher”. It is a documentary produced by spending six months in the junior high school campus to observe the role and concept of teachers and how they acted while facing the school culture and values. In April 2005, Masao Aki joined TITV as the Director of News Department; the following year he was appointed to be the Chief Director of TITV. In April 2010, Masao Aki was elected Chairman for World Indigenous Television Broadcasters Network (WITBN). Associate professor of the Department of Anthropology, National Taiwan University.Director of Taiwan Center for Pacific Studies,National Taiwan University. Research interest: culture and identity; mobility and transnational migration; intermarriage and adoption; Oceania; Pingtung area, Taiwan. Sun Ta-chuan was born to Paelabang danapan tribe in pinaseki, Taidong, Taiwan, in 1953. He gradated from the Department of Chinese Literature, National Taiwan University. Sun received two master’s degrees respectively from the Department of Philosophy, FuJen Catholic University and Sinology Studies, Katholieke Universiteit Leuven. He was President of Graduate Institute of Taiwanese Ethno-Development, Chairman of Department of Indigenous Languages and Communication, National Dong Hwa University; Editor-in-Chief of Taiwan Indigenous Voice; Chairman of the Board of Formosa Indigenous Dance Foundation of Culture and Arts; and director of the Association of Native Peoples' Education in Taiwan, ROC. Sun currently serves as minister of Council of Indigenous Peoples, Executive Yuan, Associate Professor of Graduate Institute of Taiwanese Literature, National Chengchi University and head of Association of indigenous writers of Taiwan. Ahronglong Sakinu comes from Xianglan (Lalaulan) village, Taimali Township, Taitung County. He is a full-time police man working on nature and forest conservation and an amateur writer recording the life experience and wisdom passed down for generations in his tribe in order to preserve and enhance the tradition of the aboriginal culture. Sakinu’s works have received the recognition from the Wu Yongfu Literary Award, earned the first place of China Motor Corporation Indigenous Literature Award. Sakinu himself was selected as one of the top ten literary men by Council for Cultural Affairs, Executive Yuan in 2000. Ahronglong Sakinu is the author of The Sage Hunter《山豬‧飛鼠‧撒可努》, Wind Walker: My Hunter Father《走風的人：我的獵人父親》, My Grandpa’s Ocean《外公的海》. The Sage Hunter was made into a movie and animation; several of Sakinu’s papers were selected in the textbook and were assigned as the must-read material in the Department of Chinese at Harvard University among other universities. Futuru C. L. Tsai (1971-) is a Hakka from Hsinchu. He entered the life of the Amis in A’tolan on a special occasion and started to document the life culture of the Amis by being a part of and participating in it. He had Kapah, an Amis whose Chinese name is Lin Changming, as his Amis godfather, and was given an Amis name, Futuru. Futuru joined the modern dance of the Young Amis group, or la-zhong-ciao (拉中橋) and moved to A’tolan since 2010 where he served as a deputy chief. Ever since then, Futuru has experienced dual identities between being a Hakka in Hsinchu and an Amis in Taitung where A’tolan has become his second home. Futuru was a member of River-gauche Theater Group and had worked in a semiconductor company in Hsinchu Science and Industrial Park. He received his doctoral degree in anthropology from Institute of Anthropology, National Tsing Hua University. Futuru C. L. Tsai is now a professor at Department of Public and Cultural Affairs and Institute of Austronesian Studies; he is also the Director at Center of International Affairs, National Taitung University. In addition, Futuru is the curator of Taiwan International Ethnographic Film Festival in 2011 and 2013. He has been awarded David Plath Media Award by Society for East Asian Anthropology, American Anthropology Association, and the third Life Sustainability Award. Futuru’s documentaries include Returning Home is the Beginning of Flourishing the Land《回來是土地肥沃的開始》(2001), Amis Hip Hop (2005), From New Guinea to Taipei (2009) and The New Flood (2010). He is also the author of An Anthropologist Budding in Piles of Rocks《石堆中發芽的人類學家》(2009) and From A’tolan to New Guinea《從都蘭到新幾內亞》(2011).